How often do we find ourselves ordering a meal at a restaurant, but we don’t know how it’s made? For Matthew, that doesn’t happen often, because he loves experimenting in the kitchen, learning how to make favorite dishes and exploring unconventional combinations. Since we got married in January, we’ve tried a variety of new homemade foods in the kitchen. Mozzarella cheese sticks was the first venture, and it flopped the first time because the recipe we followed left out a step. We learned just how important an egg mixture can be for holding together a recipe. 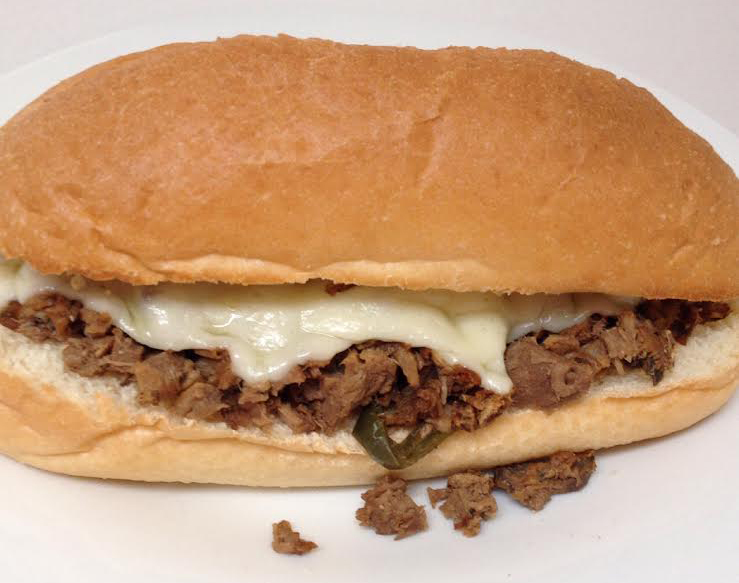 More recently, we attempted our first Slow Cooker Philly Cheesesteak Sandwiches. Molly’s dad enjoys Philly Cheesesteak (and anything with meat, cheese and bread), and Molly experienced the glorious concoction of an authentic cheesesteak during a visit to Philadelphia several years ago. Our first conundrum with the cheesesteak: what kind of steak? Obviously not New York Strip. Apparently, there are several different options, including ribeye. But how expensive do you want your sandwich to be? Especially when you’re planning to make dinner for five people? And how do you slice a steak thin enough to get that authentic Philly style? Must you visit an old-time meat market for such an ingredient? With more questions than answers, we visited a place that appears to have all the answers: Walmart. Matthew’s dad doesn’t like to set foot in the place, but we don’t mind it as a one-stop-shop for most everything you need. We first needed to decide if we could find the meat needed for the cheesesteak, and we did. From several options, we chose a thin top sirloin. Despite Matthew’s concern of not having enough steak, two pounds made a full seven sandwiches. With the big-ticket item (in price as well at $13, so don’t expect to make a cheap true Philly cheesesteak) out of the way, we easily progressed through the rest of our shopping list. Check out the ingredients list below for more. You’ll also find out how we cooked our steak with ease, and we’ll offer a tip for what you might do to make a better Philly than we did. 1. 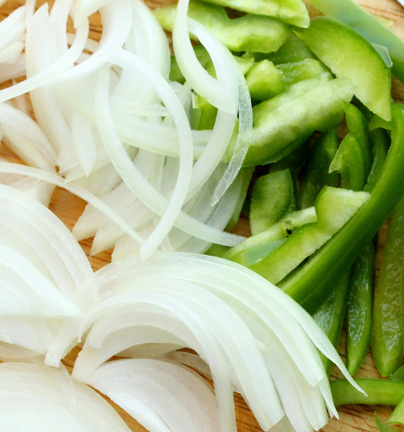 Slice your steak, peppers and onions into thin strips. You’ll need a fairly sharp knife for the meat. 2. Season the steak with salt and pepper as desired. We included a few bouillon cubes and 2 cups of water in our slow cooker for an extra boost. 3. Our family was coming over for dinner on Friday night, just minutes after we planned to get home from a full day of work. So we wanted to make Philly cheesesteaks without having to do a lot of cooking in a short period of time. Enter the slow cooker. We cooked our meat the night before and all day that Friday in a low heat in the slow cooker. The meat was incredibly tender by the next evening, but it had also fallen apart a bit more than Matthew desired. You might slice your ingredients the night before and put them into storage containers in the fridge, then put them in the slow cooker before you head out to work for the day. You might get a tender-cooked meat without the pieces being so small. The recipe we found on Pinterest suggested cooking your meat six to seven hours. 4. Once your steak has cooked, divide it up evenly (or unevenly depending on appetites and diner preferences) onto your sandwich buns. 5. Cover your steak with the desired amount of cheese. 6. Stick your cheesesteaks on a pan and heat the buns and melt the cheese in the oven. We didn’t use the oven because we’re partial to our toaster oven. If you have a toaster oven, you might want to try the same method. 7. Serve up your cheesesteaks with any side you choose. We went with French fries. Matthew’s Take: These sandwiches were much better than I expected, and they were honestly much easier than I expected. You won’t get out light on the cost, and you’ll notice that if you’re a cheapo like me. But you won’t have to do much cooking by using the slow-cooker method. After the meat and vegetables are sliced, you’re home free as long as you have the time to cook the meat. My sandwich was as good as any steak sandwich I’ve had at a restaurant. I usually find steak sandwiches to be tough and this was anything but tough, probably because the meat cooked for about nine hours. I give this recipe an A+ for taste, an A+ for ease of preparation and a B for cost. If you’re making it for a group of more than five, you’ll have to pay quite a bit to get enough true steak for a Philly. Molly’s Take: I really liked these Philly Cheesesteak sandwiches. I think it would be interesting to try another type of steak to see how different it would be. I can say that no Philly Cheesesteak has compared to the one I actually got in Philly. But this one was pretty darn good and super easy. Putting it all in the crockpot and letting it cook and stay warm meant we didn’t have to worry about dinner that night. And my whole family loved them. All in all, it was a great choice. If you try them, let us know what you do differently! And how you like them! We hope you enjoy.